Unique contact cleaner, conditioner, enhancer, lubricant and protectant for PLATED metal surfaces. Improves conductivity, maintains optimum signal quality, reduces fretting & dendrite corrosion,and stabilizes connections between similar and dissimilar metals. Molecularly bonds to both base-metals and plated surfaces and seals out oxygen, protecting both surfaces. 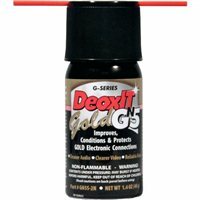 The DeoxIT Gold coating is excellent at reducing wear abrasion, arcing, RFI and intermittent connections and improves connector performance/reliability. Ideal for gold plated surfaces. On oxidized surfaces, pre-treat with DeoxIT D-Series contact cleaner.